With great thanks, The Marriott Family and Corporation is willing to share their breathtaking private property with the public. Because this is private property, horses owned by The Natural Connection INC. are the only horses permitted to live and work on the property. Guided western horseback riding is available for many different levels of riders. We cater to majority first time or beginner riders, but are happy to offer options for riders to advance in their skills, or provide a great ride for more experienced guests! beginners. We also want to keep all riders walking when riding in large groups for safety reasons. The Private Ride caters to small groups, as few as one (1) and up to ten (10). The ride time under-saddle is 90 minutes so we ask that riders arrive early. This allows private ride time to be used appropriately for warm-up at the walk, trotting, cantering and cool down at the walk. a) PRIVACY: You want private time with a Wrangler for yourself and/or your party of people and simply don't want to ride with the public. You have the option of just walking the whole time, or even doing some trotting and cantering. focus for riders learning on the trail and once the Wrangler feels the rider is proficient, cantering may be introduced. For newer riders, keep in mind that cantering will most likely not be taught in the first few sessions. It is also suggested for riders looking to further their education sign up for trail ride lessons on a weekly basis for more optimal results. New riders must learn how to balance themselves on a horse using their legs in the stirrups, not balancing on the horses mouth or the reins. Safety for both horse and rider are the priority at all times. c) YOU ARE A RIDER! : You are looking to trail ride at a place where you can put your skills to work! If you are already a proficient rider, the Wrangler will recognize this immediately and trot sets will move into canter sets halfway through the ride. This is a great option for riders that want to enjoy our horses with gorgeous scenery! This unique property also enables us to offer some UNIQUE specialty rides that would not be easily found here on the east coast. For example, our façade of an old western town is located a few miles from the trail barn, only accessible to the public if attending one of our special events, either via horseback, jeep or hay wagon. Dinner rides are offered occasionally throughout the year and are open to up to 15 riders. These unique experiences include grilled food, bonfire, live guitar player or musicians, and of course, horses in the corral, all gathered in one place, Western Town. Guests will enjoy a trail ride from the trail barn to Western Town, where they will dismount and go enjoy a relaxing dinner, dessert by the fire, story telling and then mount up and ride back to the trail barn as the sun is setting. Open to adult beginner riders, this is an all walk trail ride and is particularly popular for couples and groups of friends looking for a memorable experience. SKILLS ASSESSMENT PRIVATE RIDE - $100 PER PERSON, up to 5 people, offered Monday - Friday 10am, 12pm and 2pm. IMPORTANT NOTE...The purpose of the Skills Assessment Private Ride is to establish the rider's capabilities or proof of skills to the management, however, riding on a private ride DOES NOT guarantee a slot on a cattle drive. The rider's horsemanship skills determine eligibility. In the past, riders have been declined based on a lack of skills or stamina, riders have been asked to follow up with up to 4 more private rides in order to build skillsets and other riders were accepted immediately since proof of ability was obvious after trotting and cantering. Riders should expect to be able to mount and dismount from the ground and show balance at both trot and canter. IF YOU DO NOT WANT TO DO THE SKILLS ASSESSMENT PRIVATE RIDE(S) AS A PRE-REQUISITE, PLEASE DO NOT ASK TO PARTICIPATE IN THE CATTLE DRIVE. Cattle Drives are generally offered once a year, and are a challenge to get scheduled. Why? We now move the Black Angus Cattle, located on the B&B side of the ranch. The Head Cattleman over there will inform the trail barn one month prior to "a need for riders on horseback." We will then email riders that have completed the Skill Assessment Private Ride to inform them of the Cattle Drive date. Cattle Drive dates can be unpredictable, so riders with a more flexible schedule are preferred. The terrain is rough, rugged, and dangerous at times, so this ride is OPEN TO EXPERIENCED RIDERS ONLY. Riders essentially become Wranglers for a day. Here is a breakdown of the day. 10AM - The first hour under-saddle, after warm-up, is spent at the trot and canter. This enables the riders to get to know their horses in a group setting and learn the about the appropriate pressures with reins and legs. Forming a proper working relationship with the horse is imperative before "working cattle." NOTE: This is also the time frame used for group leaders and the Manager to confirm rider's skill sets, IF ANY RIDER IS UNCOMFORTABLE, UNFIT MENTALLY OR PHYSICALLY, OR SIMPLY UNABLE TO RIDE COMFORTABLY DURING THIS WARM-UP, GROUP LEADERS WILL TAKE RIDERS BACK TO THE BARN AND THE REST WILL CONTINUE ON WITH THE CATTLE DRIVE. SORRY, NO REFUNDS. Virginia often blesses us with a mild winter and we want to encourage our riders to enjoy the beautiful views that wintertime offers! Even though these rides are essentially a Public All Walk Trail Ride, they are special in that the scenery is unforgettable! Keep us in mind when you feel a little cabin fever is setting in! The Marriott Ranch is home to the beautiful Inn at Fairfield Farm. During certain times of the year, The Natural Connection INC and the Bed and Breakfast partner up to offer a vacation package to our dedicated equestrians! Vacation packages are designed to allow guests to stay at the B & B, and enjoy trail riding, arena riding, and other horse related activities for up to 3 days! Packages cater to the level of all riders in the group. Packages can be adjusted for beginners, intermediate and advanced level riders. Meet and Greet! Ms. Jean has dinner at the B & B with all vacation package guests and we discuss their riding history and goals for the next 3 days. This dinner is important as the information provided is how Ms. Jean creates a lesson plan for the next 3 days. 9 - 12: Horsemanship 101/Arena: Meet at the arena and Ms. Jean brings horses for each student to work with for 3 hours. 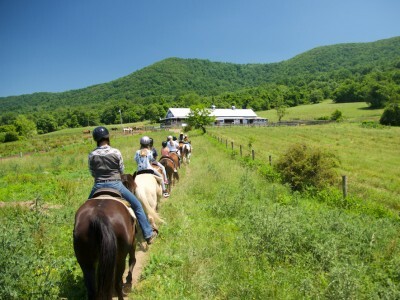 Guests learn to halter a horse, lead a horse, groom a horse, saddle a horse and mount a horse. 1 - 4: Horsemanship 101/Arena: Guests learn to ride their equine partners in the arena setting, learning about pressure and release, contact, legs, reins, as well as walk, stop, and trot, in groups and alone. 9 - 12: Horsemanship 101/Arena: Guests repeat the under-saddle work at a more intensified level and learn more about turning at the trot and working around obstacles. 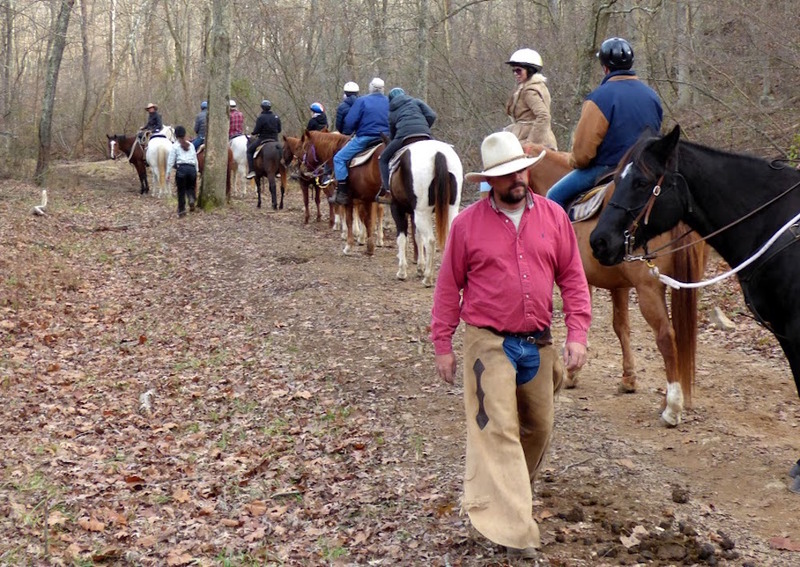 1 - 4: Horsemanship 101/Trail: Guests learn to trail ride using their new skills! 9 - 12: Horsemanship 101/Trail: Guests repeat the trot work on the trail! 1 - 4: Horsemanship 101/Arena: Guests learn to canter in the arena and then get to test their new skills in a gymkana and learn pattern work for barrel racing, polebending and egg races. Check out our Reviews and Articles! © 2018 The Natural Connection Inc. All rights reserved.